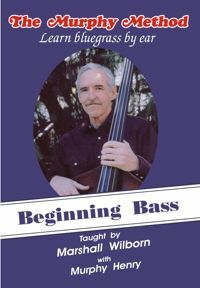 Beginning Bass: “Everybody’s going out and having fun.” If you’re not part of the fun yet, why not try the bass? Even if you’ve never played music before, we can teach you to play bass. We start simply, just plucking on the open strings. Murphy sings and plays guitar while Marshall plays bass so you always have the sound of the song in your head. We explain the chords on every song. No complicated theory or hard songs. We teach you to play in the keys of G, D, C, and A. Why stand on the sidelines? Learn to play the bass and join the fun! (And the bloopers are hilarious!) No Tab.